I have quite a lot to say about our two visits to Radici, but first things first: the cheese plate was amazing! 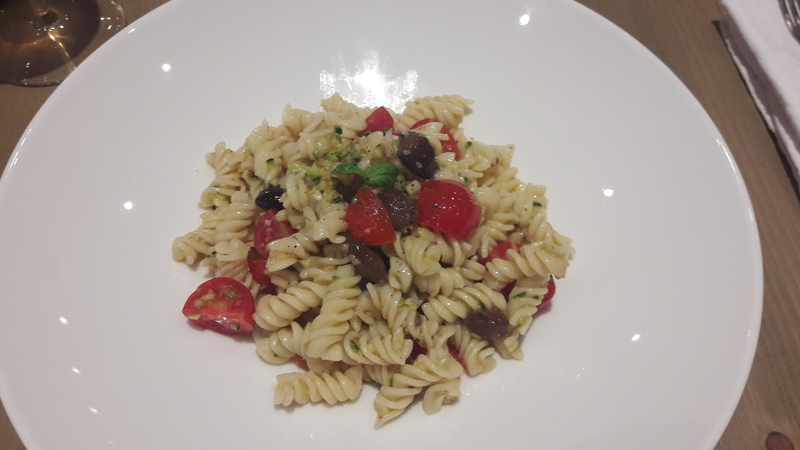 Radici is an all-vegan restaurant that also specialises in wine (of course I had a glass with my cheese), and though it looks pretty fancy it’s actually surprisingly casual and laidback. Perfect! On the first night we visited, we shared the cheese plate and another main course: rather confusingly, the cheese plate is listed with the other mains, when really it would be best shared between two at the beginning or end of the meal. 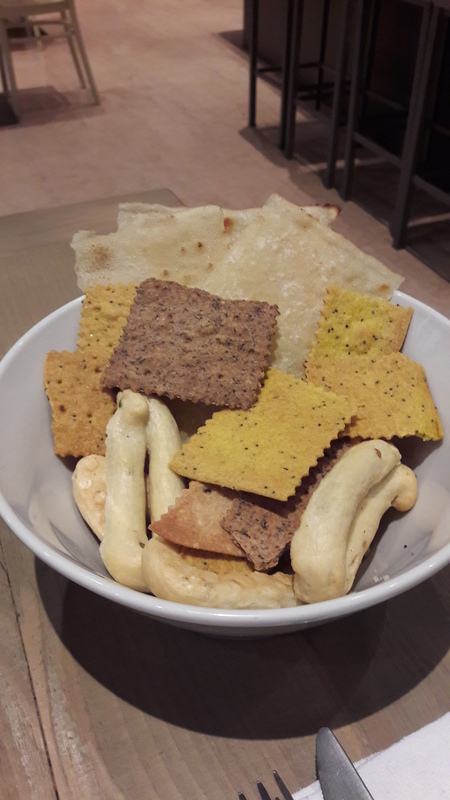 And it doesn’t come specifically with bread or crackers – this is the standard cracker basket that is delivered to every table. 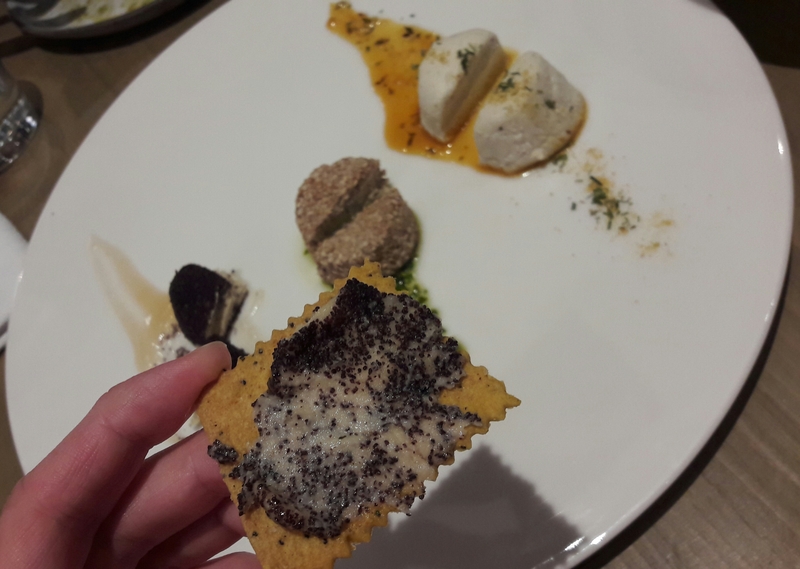 So if you’re planning on ordering the cheese plate for ‘dessert’, don’t eat all your crackers first! 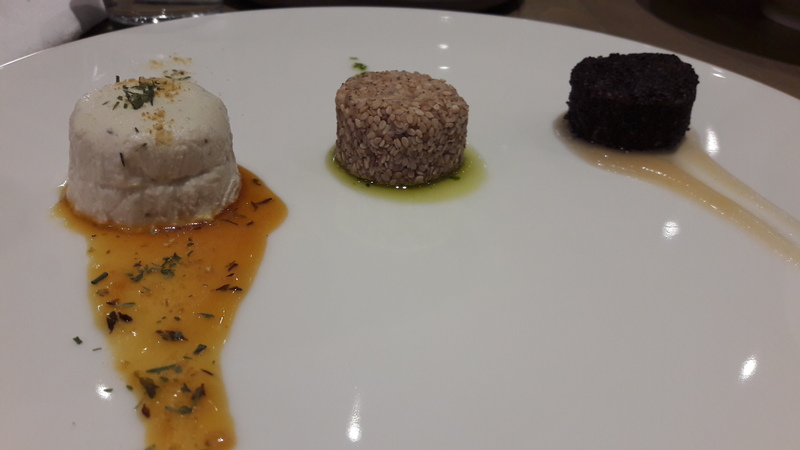 There were three cheeses, from left to right: almond ricotta on citrus jam (beautifully creamy and light); cashew cheese with black olives in sesame seeds, on pesto (so flavoursome); and cashew cheese with poppy seeds, on apricot jam (I loved that poppy seed coating!). 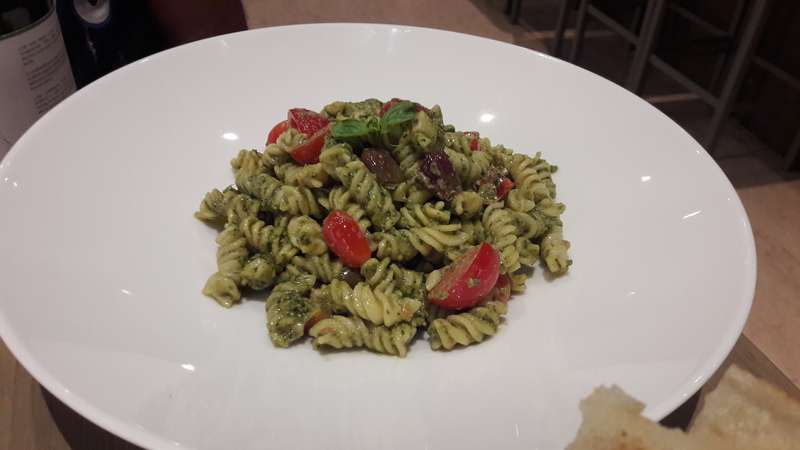 The portions were tiny, and it cost €14, but it was so lovely I would be happy to have it again for a splurge. What kind of trickery is this?! There were some little bits of courgette that weren’t present the day before, presumably to give the appearance of green pesto. But there was no pesto on there. If they’d run out of pesto, I wish they had just told me. It felt like a bit of a con. 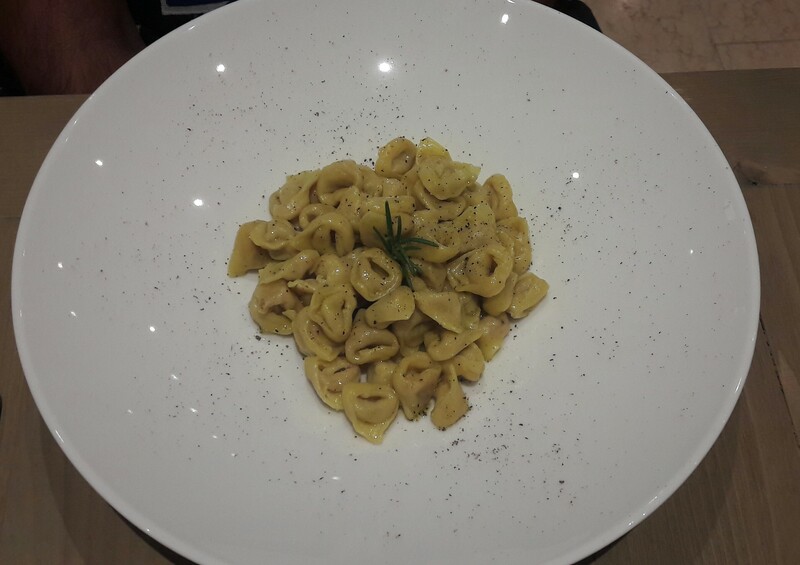 Another failure on the second night: Dr HH ordered the tortellini salad, and got this. Maybe this too would have been completely different if we’d ordered it the night before – as it was, you couldn’t really call it a salad, and we feel like it must have been missing some kind of dressing/fake butter/oil. He said it was fine, but very plain. 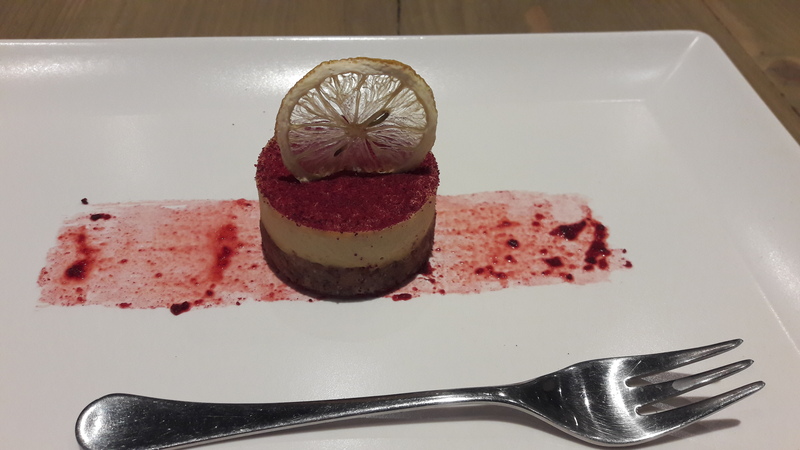 We didn’t stay for desserts the second night, feeling somewhat cheated. 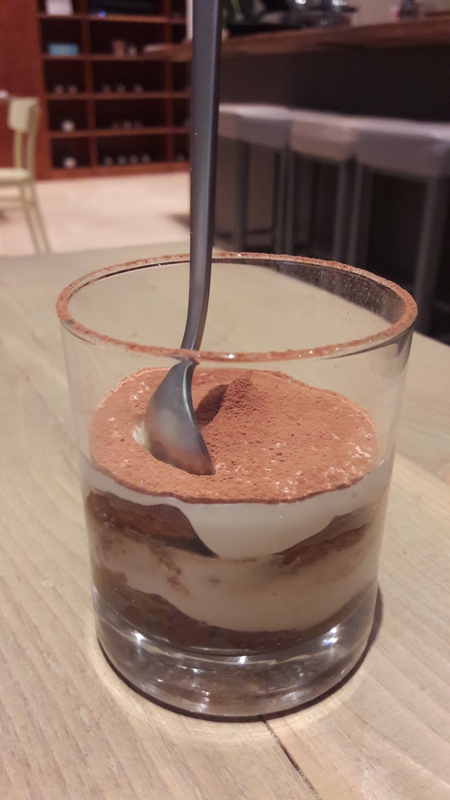 But on the first night Dr HH tried the tiramisu, his third of the holiday. It wasn’t the best (that honour still goes to La Lanterna in Verona), but he enjoyed it. And I had a fruit cheesecake. They had two different varieties on the night, and I chose this one made of mango and banana. It had a really thick base, so it gets a thumbs up from me! And finally, sticking with that glorious first visit: there was a plate of breakfast pastries on the counter, so we got a couple to take away. 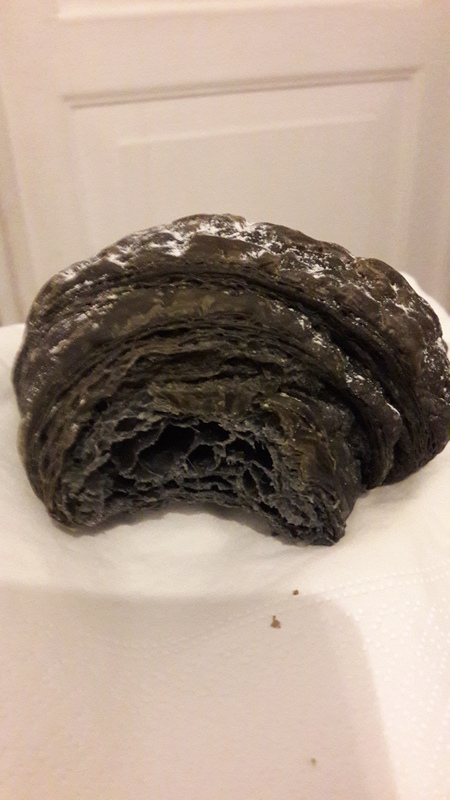 The black one is a charcoal croissant – it’s empty and the colour is purely decorative, but it was really fun to eat! 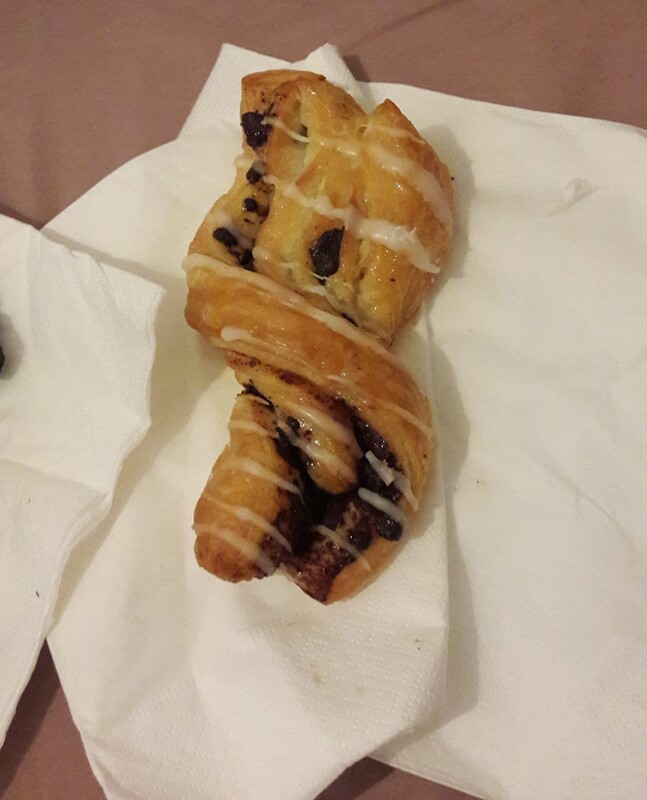 And the chocolate plait was sticky, buttery and delicious! It’s quite rare that we visit an eatery twice in the same holiday, which goes to show just how good Radici was on our first night. But the quality dropped so much the next night that I just don’t know what to think. Hopefully the second night was the anomaly – it was a Sunday, so maybe they were running low on produce and too stressed to admit it to me. I’ll always remember the cheese plate though! Have you ever been somewhere as inconsistent as this? And how quickly would you devour that cheese plate?! 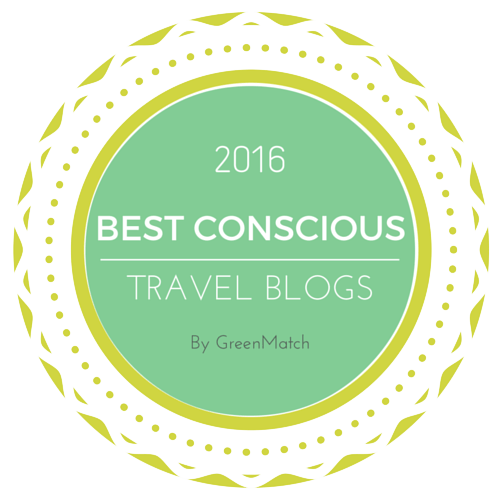 This entry was posted in Travel, Vegan Mofo and tagged Radici Bologna, vegan Bologna, vegan Italy, vegan travel, veganmofo, vgnmf17. Bookmark the permalink. Bummer that the quality went down so fast. I can only assume that it was a bad night for them. Regardless they should of told you if they were out of pesto! People are forgiving, and would rather have a meal that tastes good! I know, I would have just ordered something else – probably the cheese plate again! It was a really strange attitude.